If you're on Facebook and you're a horse lover, there's a strong possibility you're either a member of this group or you've seen their posts shared into your timeline. With more than 54,000 members, OTTB Connect is one of the largest horse-related groups on Facebook. 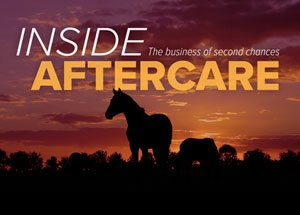 From something that started as a place to buy and sell off-track Thoroughbreds, the group's creator and current administrator has seen it transform into a large community where off-track Thoroughbred lovers share stories, educate one another, and even organize efforts to get horses out of bad situations. "I think it's kind of amazing really. ... For a group that's just for OTTBs, it's extraordinary to me that there's so much support for them out there," said Laura Holmes, who created the group approximately five years ago. The immediacy of social media and the passion for OTTBs has blended into a vibrant, always-active group. Posts range from questions about tattoo identification or how to feed supplements, to training techniques, horses for sale, or opinions that launch discussions. For many who assume Facebook is the place for animal-centric groups and pages to share cute pictures or funny videos, OTTB Connect breaks that stereotype by providing a solid educational resource to its community. "I started it when Facebook groups weren't really as active as they are now. They've kind of exploded in the last few years. I had an OTTB who I was trying to find a home for. So I started a group for horses that weren't fresh off the track so people could come into one place to buy and sell Thoroughbreds," Holmes said. "Then I started posting articles, news, and information that I'd find. Then people started asking questions (to the group) and it exploded from there." The constant stream of posts continues to bring more and more people into the group. At any time of the day, you can see users from every corner of the globe posting about OTTBs. As exciting as it was to see interest in off-track Thoroughbreds grow, Holmes struggled to be a hands-on moderator and with the never-ending work of approving members, posts, and maintaining control of the expanding community. "I've shut down the group a couple of times because I'm like I can't take it anymore, but then I've gotten messages saying, 'Please don't shut the group down, it's been so helpful.' That's really what I care about—being able to help the horses and help people help the horses. Because it's been a great source of information," she said, adding that she brought in other moderators and has taken an approach of letting the group self-moderate as much as possible. As much work as it can be, Holmes is inspired by the power of the community to come together to help horses in need and watch others discover what Thoroughbreds have to offer. "We've actually had some group rescues, where people have posted, 'I found this horse on Craigslist and he's emaciated and we need to get him out.' We've had people team up—this person is going to raise money, this person is going to transport him, this person will quarantine him, this person will help with the vet stuff. ... that's been really amazing, to see the community come together for those kinds of things." "(The group) opens this whole new world for people to find out their horse's history. ... One of the coolest things about owning an OTTB is that you have access to those things. It's been really neat to see people discover horses." Another OTTB community also finds education a key component to its posts and to the OTTB movement in general. 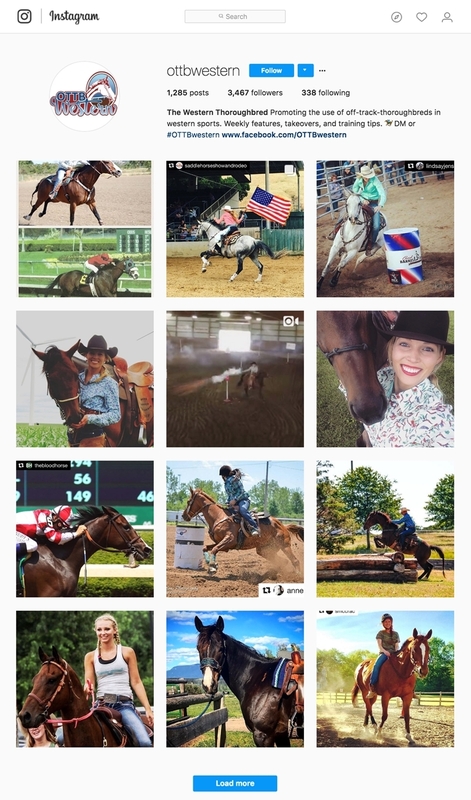 "I have a lot of people comment, 'Wow, I didn't know a horse could do that,'" said Katelin Bradley, who runs the Instagram account OTTB Western, which promotes the use of OTTBs in western sports. "I hear a lot of stories from people who have horses off the track and have been told, 'That horse is never going to be able to barrel race, what are you thinking?' I think it's a shame that some western riders have such a negative opinion of Thoroughbreds." Bradley started the page in 2015 with the goal of finding other OTTB enthusiasts competing in western events. Since then, the group has grown to almost 3,500 followers. "I noticed that there were many horses used for jumping, dressage, and things like that, but not that many Thoroughbreds are used in barrel racing—you might see them but not very often," she said. "I had a feeling there were more out there and people weren't speaking up. So I started the page to connect with them. It grew really fast and I've met people from all over the country and all over the world who compete on Thoroughbreds in western sports." Bradley said that in addition to Instagram users being impressed by the abilities of the horses and riders featured in her posts, she also receives a lot of questions about OTTBs, from feeding and training questions to how to look for a good OTTB mount. With all of the inquiries, she started posting educational posts to inform those who share her love of the breed. However, Bradley sees a potential danger in OTTBs becoming too mainstream on social media. "I've seen more people adopting or buying horses off the track in recent years," she said. "In some ways that's good, that's what we want. And in some ways, a lot of people look at (OTTB buyers/retrainers) on Facebook and think, 'Well, if they can do that, so can I.' And they don't really know what they're getting themselves into. ... That's the possible negative aspect of social media, it makes everybody feel like they can do it too, and not everybody can handle a Thoroughbred off the track."